by: David Cuartielles, Assistant Professor in Interaction Design, Malmo University, Sweden. 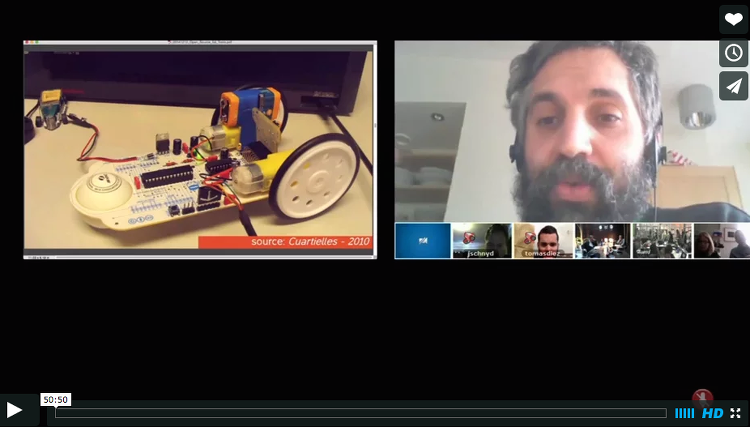 Co-Founder of Arduino, head researcher EU projects. Now available online at: https://vimeo.com/122438754. Topical and complementary lectures from world experts on digital fabrication, its implications and applications. Topical Talks are part of the Fab Academy program and available to the general public on Vimeo at http://www.vimeo.com/fabacademy. Formal (public) secondary education is a complex system where many layers of society meet: families, kids, teachers, schools and politicians have a say in how this machine should operate from different points of view, all of them valid, but somehow orthogonal to one another. Common denominator (CD) is what has traditionally ruled such a system. The system is commanded by concepts like equality of opportunities, fairness in grading, and same access to tools (note that tools for me range from screwdrivers to books). At the macro level, which in this system means the political way to solve the equation, CD has been translated in shared curriculum among schools. This feeds a whole branch of the system dedicated to create, service, and sell tools to schools and students. At the micro level, or the day to day interactions in a classroom, CD consists in the application of the curriculum, as a way to prepare the students for exams that will allow them to be classified according to regional, national and international standards. CD makes learning and teaching into a quantifiable activity. But how does this reflect in the capability of students to excel in a field, when “just enough” is good enough? How does this reflect in the teachers’ capability to transgress the establishment and to adjust to their environment? In this talk I will focus in presenting my empirical research, as part of Arduino and Malmo University, where I try to challenge the concept of CD in formal education systems by giving teachers a new process to be used in class, students a great educational experience, and politicians a fantastic story to tell. CD should stick to give people equal opportunities for people to make the best out them by themselves, but it should not hinder innovation in any of the educational fields of our formal education systems. I believe we all want a global society of thinkers, inventors and artists. If that is the case we need to leave room in our educational systems to make unexpected moves.